Ford 429 is probably famous for its run in the Mustang. Did you know the 429 is actually a 385? You might have known that. This engine goes back to the late 1960s. The 429 was rough and ready for anything that it was placed into. Well over 300 horsepower is given with the 429 as well as a large 7.0L V8 displacement. 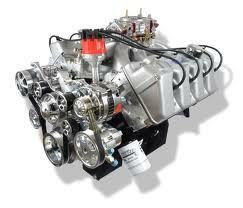 Our Ford 429 crate engines for sale fit easily into your engine budget. We don’t have to discount the price tags that we put on crate engines but we do it anyway. Everyone loves to get a great deal and why not get one with a new crate engine purchase. Ford engines are unique not just because of the power and size. These engines are in demand due to decades of longevity. Ford produces engines that last decades not years. The very same engine technology that was used in the 1960s is still in use today. Other manufacturers cannot compete with what Ford gives to the engine world. There are more classic Ford engines that are on best seller lists than any automaker in U.S. history. We build crate engines because the demand for them remains strong. We also like to please customers with our expert engine building skills. Let’s face it there are builders everywhere. Who do you trust? How much warranty protection do you get? How much is shipping? It’s questions like these that we receive almost daily. We are sure that customers have already performed engine research before they go to buy a motor. Searching on eBay first is probably not the best method. We know people do it but have never met anyone that had a good experience there. We sell the old fashioned way. We use experts to build the engines, experts to sell them and experts to ship them. It’s much easier getting an eBay username but we’re professional. It takes work to be a pro and we don’t back down because we get extra pressure put on us. You need a 429 and we have the solution. Ordering our engines is easy. Shipping them is easy too because we use only highly trained experts. What goes on in our warehouse would be surprising to most people. We literally send out and receive hundreds of engines daily. It is a well oiled machined and very much like our 429 engines. Everything flows smoothly and there are no surprises or issues that arrive with each shipment. Engines get out fast here and can arrive in time for any special project or purpose. Getting a crate engine is not so tough when you have a dedicated staff like what we have. Unlike some engine companies, our quotes are forever and will not change. What we quote you today is good tomorrow and the next day. We have just one single price. That’s what you get when you put your information into the Ford 429 crate engine quote form. Try it now and you’ll be shocked at how little engines cost here. You can also call our team at (336) 355-5679. We’ll go to work for you and give you the best engine buying experience you’ve ever had. Does that sound like a deal?